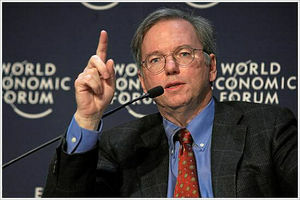 Eric Schmidt (born April 27, 1955) is the chairman and CEO of Google and chair of the New America Foundation Board of Directors. 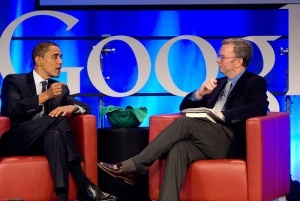 Schmidt has worked as Chairman of Google since 2001. Under his leadership, Google has dramatically scaled its infrastructure and broadened its offerings while maintaining a culture of strong innovation. Schmidt serves as Chair of the Board of Directors for the New America Foundation. He is also listed as serving on the Leadership Council for the organization, and contributing over $25,000 each year. Founded in 1999 by Ted Halstead, the Foundation is a leftist public policy institute which claims to be nonpartisan, and seeks pragmatic solutions to "the next generation of challenges facing the United States". He and his wife, Wendy Schmidt donated over $1,000,000 to the Foundation in 2008. On Dec. 15, 2010, President Barack Obama met with the following business leaders: Greg Brown, Motorola; John Chambers, Cisco Systems; Kenneth Chenault, American Express; Dave Cote, Chairman of Honeywell International Inc.; Scott Davis, UPS; John Doerr, partner at Kleiner Perkins Caufield & Byers; Mark Gallogly, managing partner at Centerbridge Partners; Lew Hay, NextEra Energy; Jeffrey Immelt, General Electric; Ellen Kullman, DuPont; John Lechleiter, Eli Lilly; Andrew Liveris, Dow Chemical; James McNerney, Boeing; Indra Nooyi, PepsiCo; Paul Otellini, Intel; Penny Pritzker, Pritzker Realty Group; Brian Roberts, Comcast; Jim Rogers, Duke Energy; Eric Schmidt, Google; and Robert Wolf, UBS. The stated purpose of the meeting was to discuss ways to work together on economic issues including job creation. "I believe that the primary engine of America's economic success is not government, it's the dynamism of our markets. And for me, the most important question about an economic idea is... whether it will help spur businesses, jobs and growth." This page was last modified on 26 November 2011, at 15:28.